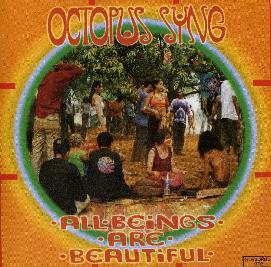 Octopus Syng - "Rainbow Coloured Mandala" / "All Beings Are Beautiful"
Octopus Syng is basically a one man project (Jaire) from Finland. This is his second CD (released in late 2000) and he has a brand new 7" released in 2003. This CD contains 7 tracks and runs a little over 20 minutes. The music is a floating 60's inspired psychedelic folk rock. Sometimes it gets a bit tribal with the different types of drums. There is a not a whole lot of keyboards-organ, with the songs clearly structured around the guitars and percussion. "Unite Moons" and "Suns" are quite Pink Floyd inspired. The vocals and the lyrics are not so important as they are mixed in a strange way as to make them not very clear but a bit psychedelic. An interesting project and if you did not know Jaire was from Finland you would never guess that from the music! Octopus Syng will be playing a gig at the Psychotropic Zone in Helsinki on Oct 31st. All Beings Are Beautiful is the most recent release by this one man Finnish project. This was recorded at his home studio in 2003, exept for "Welcome To The World Of Fairy Tales" (2001). "Soft Jewel" starts side A and is a very 60's inspired folk song. He writes very nice lyrics. They are really more like poetry!. "Welcome To The World Of Fairy Tales" reminds me a bit of Reefus Moons early stuff. A lot of different kinds of percussion can be heard on the recording. The b-side begins with "Together On The Shore" which has a beautiful guitar line. "Shanti Shanti" is very Syd Barrett inspired. A very interesting project! For more information you can visit http://www.unimeri.com.